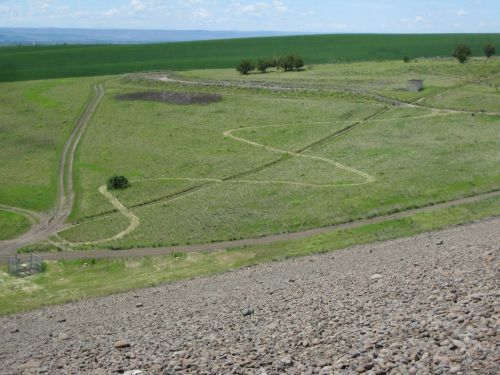 The Bennington Lake Trail System is a series of trails located in the Walla Walla Valley in Walla Walla, Wa. The trail takes you around Bennington Lake giving you scenic views of the Blue Mountains, Bennington Lake and the fertile fields of the Walla Walla Valley. From Walla Walla, take highway 12 east to the Airport Way Exit. Turn right on Airport Way and continue onto Tausick Way. From Tausick Way turn right onto Reservoir Rd. Follow Rerservoir Rd until it ends at Bennington Lake. In 1931 the City of Walla Walla suffered a flash flood that did a large amount of damage. Virgil B. Bennington, President of the Walla Walla Chamber of Commerce, lobbied the United States Congress for a flood control project to protect the city from future flood events. In 1941 the Mill Creek Project was completed by the Army Corps of Engineers. The Mill Creek Project was unique in that it used an off stream reservoir to store flood water during a flood event and releases it after the flood risk has passed. Recreation was added to the mission of the Mill Creek Project in 1965. Bennington Lake, then Mill Creek Reservoir, was partially filled for recreational purposes soon after and fishermen soon started exploring the area around the lake and the Bennington Lake Trail System began to take shape. Today there are about 20 miles of multipurpose trails winding their way through approximately 600 acres. There are 2 named trails in the system; the 4.8 mile Whitetail Trail and the 2.6 mile Meadowlark Trail. The Whitetail Trail follows the property boundary for most of its length and takes you to some of the more remote parts of the Bennington Lake where wildlife such as whitetail deer, American kestrels, great horned owls and the occasional coyotes. Black locust savannah, native bunchgrasses, and mixed prairie all represent themselves along the Whitetail Trail, as well as a dam crossing where a person can see how water is diverted during a flood event to Bennington Lake from Mill Creek. This trail is a favorite of mountain bikers and horseback riders. The Meadowlark Trail follows the shoreline of Bennington Lake closely during the spring and summer months while the lake is filled to its recreational pool. The trail crosses the face of the Bennington Lake Embankment Dam on one side of the lake and the intake canal that feeds the lake on the other. In the spring the intake canal may have a small amount of water running through it, no more than 3 inches unless there is a flood, so plan on wet feet or taking a detour. Local Audubon Society Members sometimes call one section of the trail owl alley because of the large amounts of owls they can see almost every time they visit. The rest of the trails consist of service roads and unnamed trails. Small sections of trails have formed between service roads, the named trails, scenic view points, and favorite fishing spots. What were once game trails or social trails have been turned into officially maintained trails if they have been deemed useful and not a detriment to the environment. With so many options for visitors to choose from many people pick a different route every time they come out. Picking a different route every time is difficult for some people though, because using the trails has become part of their daily exercise routine. The large variety of trails offer differing levels of difficulty so anyone can find a route whether they are walking, running, biking, swimming, or practicing for a backpacking trip. In 2009 the Mill Creek Project introduced an adopt-a-trail program that quickly became a success. Trail adopters are asked to clean and check up on their trails once a month in the spring, summer, and fall. Volunteers now report trail obstructions, mowing needs, or any other hazards to help keep the Bennington Lake Trails safe for everyone. Some of the volunteers have also opted to mow their section of trail, saving the Mill Creek Project a lot of time and labor. With the adopt-a-trail program being a success the Mill Creek Project hosted its first National Trails Day Event in 2010. The 2011 event had about 30 participants and re-routed an erosive section of trail to a more sustainable winding trail. The Washington Army National Guard partnered with the Mill Creek Project for their Guard the Environment event and completed a different section of the trail that was worked on for National Trails Day. The Bennington Lake Trail System host many special events throughout the year. The three largest events are the Onionman Triathlon, the St. Mary's Cancer Center Gran Fondo, and the Allegro Cyclery Cyclo-cross Race. The Onionman Triathlon is a mini-triathlon that involves a swim in Bennington Lake, a bicycle race that takes them into the Blue Mountains, and a run from Bennington Lake to Mill Creek and back. The Onionman has between 250 and 300 participants annually and can be used as a qualifier for larger triathlons. The St. Mary's Cancer Center Gran Fondo is a fundraiser for the local hospital Providence St. Mary. The event includes a horseback ride, walk, and run event around Bennington Lake. The Gran Fondo also includes a bike ride and motorcycle ride that take place in other portions of the Walla Walla Valley. The Allegro Cyclery Cyclo-cross Race is a cross between a mountain bike race and cross-country cycling. The cycling enthusiast race across the dam, then go off-road racing up and down hills, through twisting obstacles, and even have to carry their bikes through some sections. The cyclo-cross race is relatively new to the Bennington Lake Trails, but seems to be growing every year. This trail system offers many stunning views of the Blue Mountains as well as some peaceful places to stop along the trail.